Earlier this month, Katie (our younger daughter) and I were in search of garage sales along the west side of West Lake Okoboji. We didn’t have luck of the garage sale kind, but were lucky to accidentally see, from Highway 86, part of the “Big Bugs” exhibit. 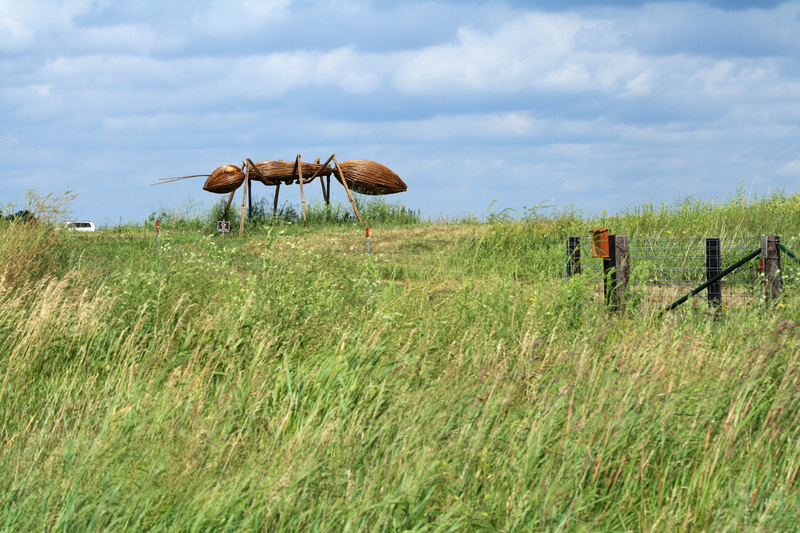 Not knowing there was such an exhibit, I marveled at the hugeness and design of the ant sculpture, especially because it was out in the middle of nowhere. Last weekend Bill and I went to see the same giant ant. Bill, always acutely observant, pointed out that there wasn’t just one ant, but three. Between Google and an Iowa Lakeside Laboratory brochure, we’ve learned the following. "Ant #2" is in this photo. It is the middle ant in the above photo. I took this photo from Highway 86, facing mostly east. For more information about the laboratory’s 100th anniversary, go to the Lakeside’s website at www.lakesidelab.org. More information about the “Big Bugs” exhibit is available at www.big-bugs.com. 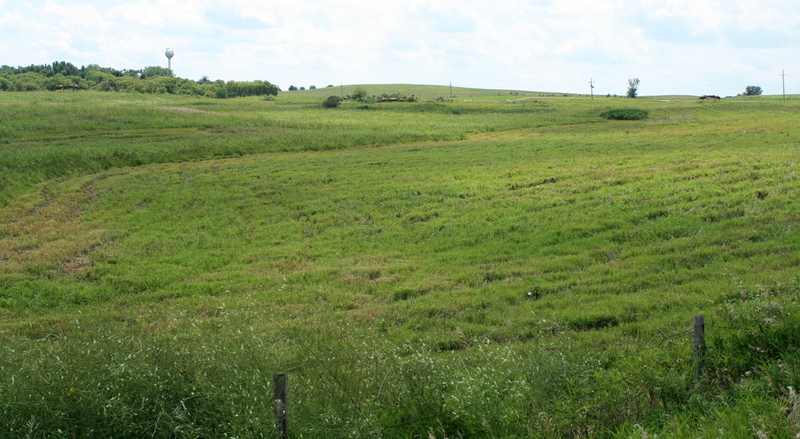 This entry was posted on August 21, 2009 at 1:27 pm and is filed under Iowa, Okoboji. You can follow any responses to this entry through the RSS 2.0 feed. You can skip to the end and leave a response. Pinging is currently not allowed. I’m so glad you wrote about this. I had seen something about it towards the end of our stay at the lake and then forgot about it. I overheard someone talking about it, too. It would have been neat to see. I hope Martha and Daddy see it. My college roommate Marji worked at the Lakeside Lab, so I’ll have to let her know about the 100th anniversary and the Big Bugs. These are impressive sculptures. Daddy and I will dfeinitley need to check these out. I will only add that it makes me think someone had too much time on his hands to set out sculpting huge bugs! 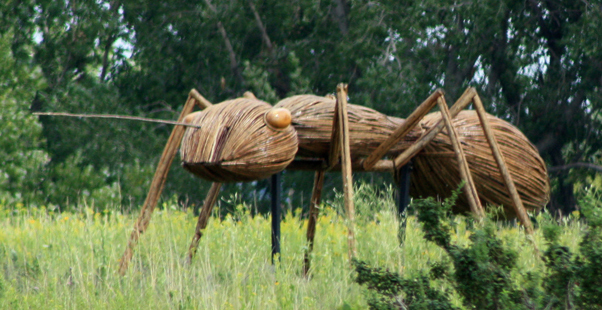 I had to laugh at the large ants, as I started an unofficial ” collection” of photos of large things a few years ago. Of course we know of the Indian maiden in Pocahontas, but I found three large scultures (I use the term loosely)in Marshalltown, when visiting Jana. There’s a large chicken (rooster?) atop Cecil’s restaurant just off Hwy 30 on the main drag into town, and of course the famous (from my childhood traveling old Hwy 30) pink flamingo of the Flamingo Motel fame. There’s also an oversized bowling pin near a now defunked bowling alley. I laugh at myself when I pull over to take a photo of other large statues. Clear Lake has their own large chicken and a very large twist ice cream cone at The Barrel Drive In on Hwy 18. As you can imagine, Gus groans whenever I spot something new to be photographed for my collection, as he did over the Clear Lake items. On the way home from Rathbun a few weeks ago, we came across two large dinosaurs, which Gus was even interested enough to step out of the vehicle to view. The kids stayed in the AC, as it was a sweltering hot afternoon. We actually thought of your dad, as they were constructed from machinery parts. I can’t remember the hwy or the business that they obviously belonged to. Oh yes, and there was also a very good likeness of the Tin Man from the Wizard of Oz standing nearby. As an art major, it’s not the art I’m particularly impressed with, I just chuckle over the large scale. I had my own version of a huge ice cream cone Gus helped me construct for a library float (no pun) years ago. He got carried away with the chicken wire. The base was a plastic barrel. It was a sight to behold, for sure. Nancy, if you happen to determine where exactly the dinosaurs and the Tin Man were/are, I’d be interested to know in case we are ever that way, especially with Jackson. I did not know about any of the large sculptures you described, but am glad I do now! Like the article said, these ants are GARGANTUAN!!! Or, more accurately, GARGANTUANT!!! (Hehehe. Love it! :-)) Made of trees, saplings, and more. That’s pretty wild. How creative, resourceful, ambitious, and industrious!!! I couldn’t see the ants in the middle/landscape photo until I enlarged it. I thought maybe you were spoofing me. 😉 What a novelty post!